Smart by name and smart by nature. The smart fortwo set a new standard for small and smart urban mobility when it was launched in 1998. Since then over 1.5 million have been sold. – a small two-seater with the engine in the back for urban dwellers – the new car promises more space, more colour and more equipment. At 2.69 metres , the new one is just the same length as the old one so it’s great they haven’t gone bigger like so many others do (looking at you Mini!). It would defeat the whole concept if they did. The smart is about small transport for urban centres for individuals (and occasional passenger). Short overhangs, minimal length, good economy, tight turning circle, rear fitted engine for extra mobility and space inside make it a great car for parking and driving in congested cities. If you travel to any European city you will find smart cars everywhere; two or three squashed crossways into a parking space, perched on pavements and anywhere you never expected to see a car parked. The smart car never really caught on in Ireland but you do see the odd maverick bopping around the city in one. The previous model was somewhat noisy, the ride was on the firm, uncomfortable side, and the semi -automatic gearbox was jerky and altogether not the smoothest car to drive. It remains to be seen if these issues will have been ironed out. 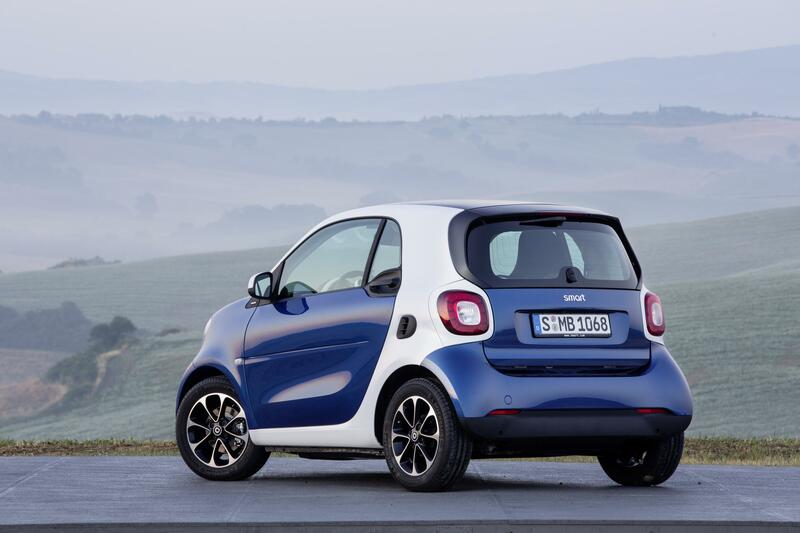 While many may laugh at the smart’s tiny dimensions and dinky looks you can’t deny its charm. For urban trendsetters it was a way to embrace urban mobility and exert personality over a car. The smart is a trendy, colourful and funky car and the colour contrasts between the tridion safety cell and bodypanels is another characteristic feature of the smart brand that has been retained in the new one. A series of special editions and variants like the smart cabrio and Brabus tuned version have kept the smart car fresh and relevant since its launch in 1998. Here’s a look at some special moments in the smart’s sixteen year history.